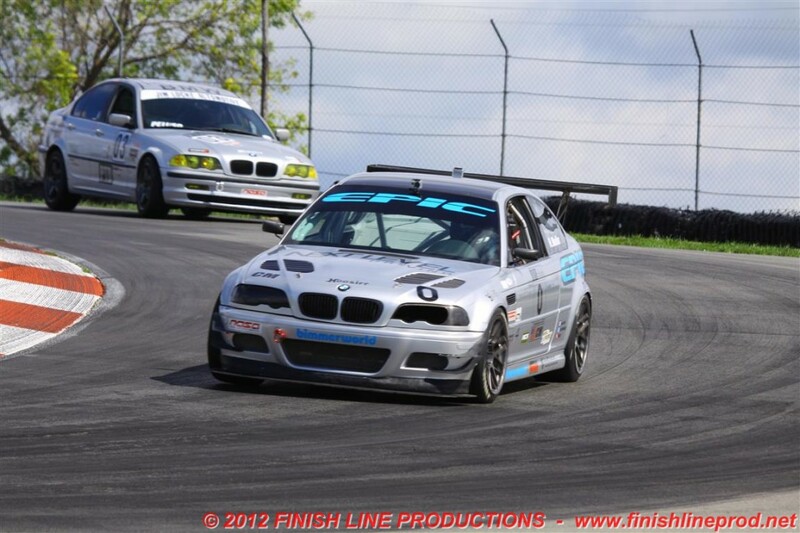 Epic Motorsports, a well-known BMW engine building and tuning company based in Miami, Florida, pulls off the hat trick by winning the two qualifying races and the Championship race. The National Auto Sport Association German Touring Series (NASA GTS) consists of production based race cars built from the various German manufacturers. The cars are classed using a power to weight formula that makes for a level playing field with very tight and competitive road racing. NASA has an annual gathering of well over 300 cars that compete nationally in their respected classes. The championship format is comprised of two qualifying races that set the grid for the final Championship race. The weather conditions were continuously changing over the three race days which required constant setup changes for race teams. Randy Mueller piloted the Epic Motorsports BMW E46 M3 to the checker flag in the Thursday qualifying race in a commanding fashion. Starting 4th, he managed to make his way to the front by the 3rd lap and maintained the lead until the checker was thrown. For the second qualifying race, Mueller started on the pole. As the cars were heading to the grid, the skies opened up making for treacherous conditions which required a last minute change to a wet setup. With poor visibility and excessive standing water making track conditions similar to driving on a sheet of ice, Mueller lapped the course 3 seconds faster than his competitors which resulted in a solid victory. The two first place finishes granted starting from the pole position of the 42 car field for the Championship race on Saturday afternoon. From the drop of the green flag, Mueller was gapping the field and set a new track record of 1:30.553 until a full course yellow occurred. On the restart the, starter threw the green flag for the wrong car which was further back in the field. Mueller was driving under the speed for a full course yellow in anticipation of being picked up by the pace car when several cars bunched behind him blew past at full speed capitalizing on race control’s error. It didn’t take much time for Mueller to charge back to the lead he held before the full course yellow. 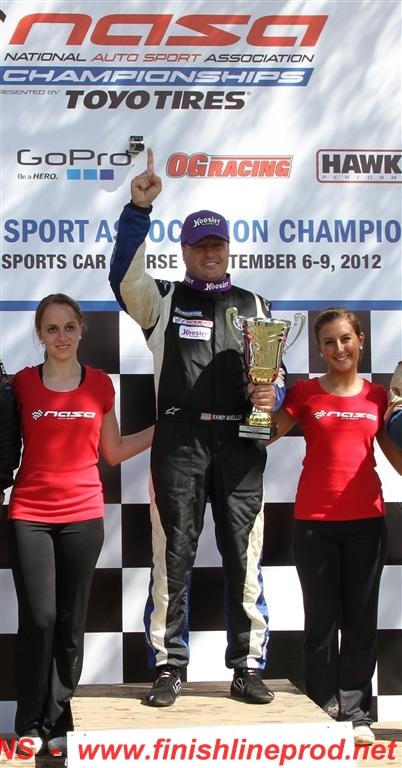 He continued to hold the 1st place position until the checker flag was thrown. In general BMW’s had a very strong showing. Epic Motorsports would like to congratulate those who managed to stand on one of the highly sought after steps of the podium at NASA Nationals at Mid-Ohio Sports Car Course; especially, those in the GTS Series. In GTS 4, the first and third steps were filled by drivers whose engines were calibrated by EPIC. In GTS 3, all three steps were occupied by drivers that had one of EPIC’s custom calibrations. In fact, the top 6 finishers in GTS 3 had their engines calibrated by EPIC Motorsports! Congratulations to Jamie Frauenburg (GTS4 3rd place), Josh Smith (GTS3 1st place), Eric Wong (GTS3 2nd place) and Stefan Sajic (GTS3 3rd place), the EPIC podium drivers who made it to NASA Nationals and more importantly the checker flag. It gives Epic Motorsports great pleasure to take part of their racing success and we are grateful that they have chosen to run EPIC BMW engine calibrations. Special thanks to our sponsors BimmerWorld, Performance Friction, and Motion Control Suspension for your support and products that are instrumental in our success.